The wave of unrest sweeping Syria will drive President Bashar Assad from power and severely weaken the Islamist regime in Tehran, a prominent dissident predicts. "It is a certainty the Assad regime will fall," said Farid Ghadry, president of the Reform Party of Syria (RPS). Ghadry, currently living in the United States, closely monitors the situation in his native land through a network of contacts there. He said his organization is getting reports that Syrian security men appear tired and demoralized and have reached "levels of mental and physical fatigue they are not prepared for." Syrian forces killed as many as 40 people during weekend clashes and human rights groups say the total death toll during three months of unrest is more than 1,100 people. A new online video shows Syrian soldiers joking over the bodies of some of those killed. "Your father told you to watch out," one soldier says over the body of someone with a head wound, "but you didn't." There are also reports like this which say that Syrian soldiers who have refused to kill demonstrators have been gunned down on the spot. Recent pictures show Syrian soldiers looking "exhausted, like they haven't slept for days," Ghadry said. "No regime can sustain itself for long with its security men always on alert, its government under siege, and its economy getting worse by the day," he told the Investigative Project on Terrorism. "The real question is how it will fall and who will replace it." 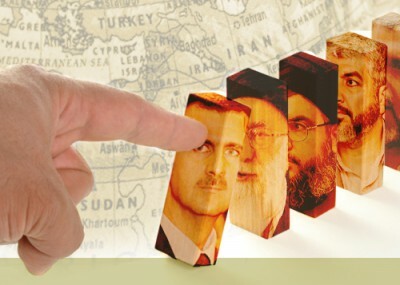 The current turmoil in Syria (the most serious domestic threat to the regime since it suppressed a violent rebellion by the Muslim Brotherhood close to 30 years ago) is potentially very troubling for Assad's top ally, the Islamist government in Tehran. The international community's failure to effectively respond to Iran's rogue behavior such as its support for terrorism has created the impression in the Middle East that the Islamic Republic is "invincible," Ghadry said. He predicted this situation would undergo a dramatic change if Assad and the Ba'athists were driven from power. Regime change in Syria would deal a major blow to jihadist terror networks and state sponsors, potentially jeopardizing Iranian weapons shipments to organizations like Hizballah, Hamas and Palestinian Islamic Jihad. "Many of the Iranian opposition figures I have talked to have indicated that if Syria [Assad] falls, Iran will follow," he said, with that radical regime replaced by a government committed to "freedom and democracy." In his efforts to crush dissent within Syria, Assad has brought in Iranian advisers including members of the Islamic Revolutionary Guard Corps (IRGC) and its elite Qods Force. In June 2009, the IRGC played a key role in the Iranian regime's bloody crackdown against citizens protesting falsified election results. Given Tehran's success in suppressing peaceful dissent in 2009, Assad is hopeful that Iranian help will enable him to crack down in Syria. Iran has shipped riot-control gear and computer equipment to the Assad regime. The Syrian government is using the latter to target regime critics. Ghadry pointed to a recent Washington Post story describing how Iran is helping Assad maintain his hold on power. The story noted that in March, Assad announced "with great fanfare" that he was lifting Syria's ban on the use of social media like Facebook and YouTube. It was portrayed as a "reform," but was nothing of the kind. In reality, it gave Assad and his Iranian allies a critical tool for tracking down and arresting leaders of Syria's protest movement. In Syria, the IRGC is "leading the effort to oppress the population," Ghadry said. The Assad regime saw what it did in Iran in 2009 and said, "OK, you handle it" when it comes to targeting dissenters in Syria, he told the IPT. Ghadry criticized Secretary of State Hillary Clinton's suggestion that Assad is a "reformer," saying that her comments are interpreted by Syrians as "supporting" the Syrian government and its oppressive policies. He believes that Senate Foreign Relations Committee Chairman John Kerry, who has reportedly pressed Israel to relinquish the Golan Heights to Assad, is making a mistake. Assad "is not interested in peace," Ghadry said. He said it is "delusional" to think Israel can achieve genuine peace with a violent regime in Damascus that is simply interested in clinging to power. In October 2001, Ghadry joined fellow American Syrians in forming the RPS with the intent of replacing the Ba'athist Party dictatorship in Damascus. The party's mission statement calls for replacing the Assad regime with a multiparty democracy and for removal of weapons of mass destruction from Syria. The RPS "welcome[s] peoples of all races, religions, and affiliations in our party as long as they do not practice violence and they separate religion from their political lives." As he looks towards the future, Ghadry does not mince words about the Muslim Brotherhood, which seeks to dominate the opposition movement in Syria. He notes that U.S. policy may be helping the Brotherhood's efforts to marginalize non-Islamist opposition to Assad. According to WikiLeaks, since 2005 between $6 million and $12 million in U.S. funds went to Syrian opposition groups. Much of this money went to the Movement For Justice and Development in Syria (MJD), an organization reportedly headed by former Muslim Brotherhood members. The money apparently was funneled through the State Department's Middle East Partnership Initiative. "I cannot tell what our diplomats are doing," Ghadry told the IPT. "Are they doing this to understand the MB, which would be a smart move, or have they really fallen under the spell of the Islamists with their Western appearance and sweet words? That kind of naivete does exist in some of our diplomats, unfortunately. Out of the wrong sense of historical perspective, they fall prey to the very same people we should all unite to defend ourselves against." Ghadry believes that U.S. government priorities are skewed. Instead of funding non-Islamist Muslims, Washington has been directing money to Islamists he refers to as "young MB-lite" - people who will be swept aside if Brotherhood operatives come to power in Damascus. These people "will be eaten alive by the real MB upon their return to Syria," he said. If the West thinks "that this new generation of young Islamists represents Syria's future, then the region is in trouble." But Zuhdi Jasser, founder of the American Islamic Forum for Democracy (AIFD) and Save Syria Now!, emphasizes that it would be a mistake to "allow valid concerns about what may come after to prevent us from acting against Assad." Secular dictatorships like the Ba'athist government in Syria "create the conditions which bring the Muslim Brotherhood into power," said Jasser, the American-born son of Syrian parents. Like Ghadry, Jasser believes that Assad will fall. But the violence could drag on for months before that happens. One reason is that the Syrian military leadership is heavily implicated in Assad's crimes. "They know they will be on trial for crimes against humanity if the regime falls," Jasser told the IPT. But these people on the streets cannot go back home, either, because they face execution by the government, he said. Jasser expressed doubt that the Muslim Brotherhood will be able to seize power in Syria, and predicts the group would be soundly defeated in any democratic election there. One benefit of this development would be to make clear to the Egyptian people "that the Brotherhood could not come to power in a free election." Ghadry urges the Obama Administration to take action "to empower the liberal and secular leaders" to prevent a repeat of what happened following the 1979 Iranian Revolution that toppled the Shah. Many members of the coalition that overthrew the monarchy were liberal and pro-democratic. But they were swept aside by Islamist revolutionaries aligned with the Ayatollah Khomeini. That scenario will repeat itself in Syria if the Brotherhood takes power, Ghadry warned. He urged European governments and the United States to choose carefully how they spend the $40 billion they recently agreed to spend on "Arab Spring" movements. If the money goes to Islamist groups like the Brotherhood, "these funds will indirectly be used against Europe by Islamists who want their opponents to emigrate to Europe in droves. I cannot emphasize to the Europeans how important it is for the EU to support liberal and secular groups, as opposed to the Islamists." One potential wild card is Turkey's Islamist Prime Minister Recep Tayyip Erdogan, a close ally of the Muslim Brotherhood and until recently a political ally of Assad. Recently, Erdogan has questioned whether Assad was genuinely prepared to make "reforms." Ghadry believes that after Turkey holds elections on June 12, Erdogan may try to lean on the Muslim Brotherhood to reach an accommodation with Damascus.